Passengers arrive with their luggage at the Beijing Railway Station to catch their trains home on the eve of the Chinese New Year in Beijing. HONG KONG — Decades ago the Chinese New Year holiday, also known as Spring Festival, had little impact outside of China. 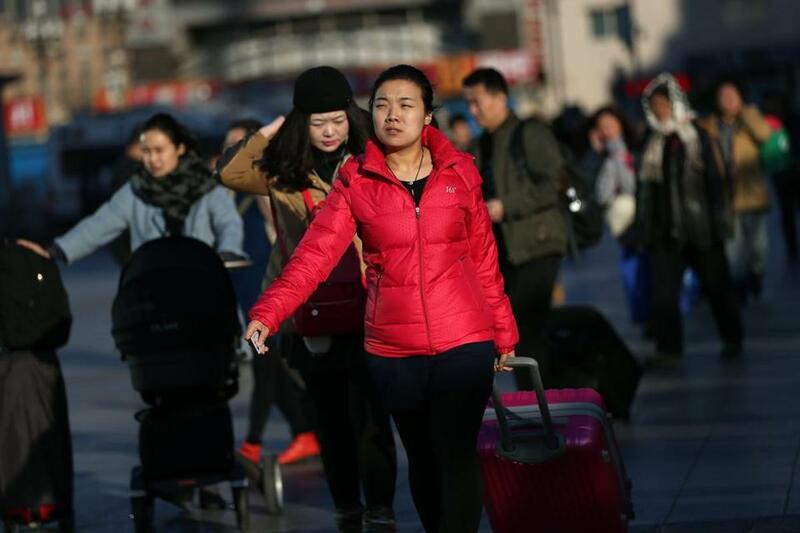 But as the country has gained outsized economic influence, the holiday, which has enormous cultural significance in the Chinese-speaking world, has become more prominent. This is how it ripples around the world. It all means an annual headache for retailers and importers overseas who rely on China. Shipping companies warn customers that China’s transport and logistics networks are at capacity and their shipments must be at ports two weeks ahead of the holiday to stand a chance of getting on a boat before the country shuts down. This year, shipping delays are compounded by a slowdown at US West Coast ports. Stock market trading shudders to a halt as mainland China shuts for an entire week and financial hubs such as Hong Kong and Singapore take a break as well, albeit shorter. Numerous other countries, including South Korea and Vietnam, also observe Lunar New Year holidays. Muslim majority Malaysia and Indonesia, with large Chinese minorities, take holidays too. Trading volumes ‘‘drop off considerably’’ about three working days before the start of the holiday, said Andrew Sullivan, managing director at Haitong Securities in Hong Kong. This year, Friday was ‘‘the last day that you can sell in Hong Kong and get your money before Chinese New Year’’ under trading settlement rules, he said. Foreign investors also tend to wind down trading in Asia as the holiday nears, Sullivan said. Harrods is selling its own brand of red envelopes traditionally used to give ‘‘lai see,’’ or lucky money. Selfridges and luxury brand Burberry are each offering cards and envelopes personalized with Chinese calligraphy. Designer label Vivienne Westwood has launched a collectors’ necklace featuring a sheep pendant. Shoppers at Fortnum & Mason paying with UnionPay cards — China’s homegrown payment network — will get bonus gifts. Chinese spending in Britain last February jumped 23 percent over the same month in 2012, said Gordon Clark, manager at Global Blue, a Switzerland-based firm that tracks luxury retail spending worldwide. Chinese shoppers spend an average $1,137 per transaction in Britain each February, mostly on luxury jewelry, watches and designer clothes. Because the Lunar New Year never falls on the same date, it plays havoc with Chinese economic data at the start of the year. Economists are cautious not to read too much into figures from January or February, and prefer to wait until March to see the trends lest they make an incorrect interpretation of the world’s second-biggest economy. Last year, the holiday started on the last day of January which meant activity was more compressed as factories rushed to get their orders out the door. This year, the holiday falls about two and half weeks later, so factories had more time to work on orders. The result is that this year’s January trade data, for example, was artificially weak. The holiday is celebrated by Chinese communities around the world. In San Francisco, where about one in five residents is of Chinese descent, the celebration is stretched over a few weeks, with fairs, beauty queens, bazaars, lion dances and deafening firecrackers in Chinatown. The festivities culminate in the San Francisco Chinatown Chinese New Year Parade, complete with feisty 270-foot-long (82 meters) dragon. It’s such a big deal that schools close for the holiday. Pius Lee, chairman of the city’s Chinatown Neighborhood Association, said its Chinese New Year celebrations resemble those in Hong Kong and Shanghai, especially the parades and family reunions where food is abundant and children get red envelopes filled with crisp ‘‘lucky’’ dollar bills. But unlike in China, San Francisco workers will take just two or three days off, said Lee. ‘‘We can’t follow China’s system because the cost of shutting down for many days here is a lot higher than in China,’’ he said. Lee said many grocery stores and other shops close for two or three days but a handful remain open to tend to the tourists who flock to the downtown neighborhood for a glimpse of China. The festivities have also embraced foreign culture. For example, the traditional red envelopes, usually decorated with gold Chinese letters, are sold by Chinatown merchants with pictures of Pokemon and Disney characters. Just because it’s a holiday doesn’t mean there won’t be any major surprises. Chinese officials are notorious for releasing big news during important holidays, unexpected announcements that ‘‘hit you with your pants down unprepared,’’ said Francis Lun, CEO of GEO Securities. The timing may be an attempt to reduce the impact on financial markets, or for the more skeptical, to bury bad news. In 2011, the central bank raised interest rates at the tail end of Chinese New Year.